Home News MacPherson Becomes First Aussie To Reign Supreme In Georgia Cup. MacPherson Becomes First Aussie To Reign Supreme In Georgia Cup. 7 years ago by Fatiha Betscher Comments Off on MacPherson Becomes First Aussie To Reign Supreme In Georgia Cup. Bryden Macpherson has become the first Australian to capture the Georgia Cup in defeating American Kelly Kraft 2 & 1 in the 15th Anniversary Georgia Cup Match at The Golf Club of Georgia. 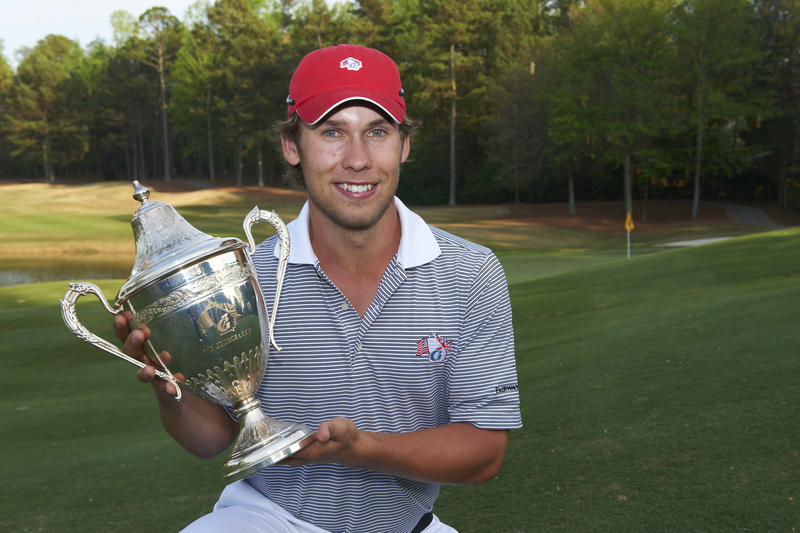 The Georgia Cup annuals pits the reigning British Amateur champion against the present U.S. Amateur winner and Macpherson’s win makes ammends for fellow Australian Nick Flanagan who lost out to England’s Gary Wolstenholme in 4 & 2 in 2004. “Obviously, my putting kept me in the match,” said Macpherson, who was 2-down to Kraft after four holes, but rallied to take a 1-up lead to the back nine. After Macpherson went 3-up through 13 with a par, Kraft came back with a 7-footer for par at the 14th to cut it to 2-down. But it ended at the par-3 17th when Kraft left himself 40 feet to the hole for birdie, putted well past and Bryden lagged his 35-footer to a foot for a conceded par. “I just never got the speed of the greens today,” said Kraft. Macpherson, who played two years at the University of Georgia, was thrilled to win an event that has featured players such as Sergio Garcia, Ricky Barnes, Richie Ramsay, Edoardo Molinari, Matteo Manassero and Peter Uihlein through the years. The Georgia Cup all-time series now stands at 8-7 in favor of the U.S. Amateur champions. “It’s just another one of those things you can add to your list as top achievements as an amateur,” said Macpherson. * Special thanks to Glenn Sheeley at Golf Club of Georgia for this information.